Damascus in Syria is one of the oldest (if not the oldest) cities in the world. Although most of sprawling modern-day Damascus is nondescript, its walled Old City and its Umayyad Mosque are outstanding. Reserve ample time to explore the ancient streets within Damascus Old City. They are lined with venerable homes - and some of the balconies of the dwellings overhang the narrow alleys so far that they almost kiss those on the other side. The crowded, covered, stunning Souk (marketplace) is also a must-do Damascus Old City experience. Goods of many varieties are hawked by shopkeepers verbally jostling each other for the attention of passing buyers. 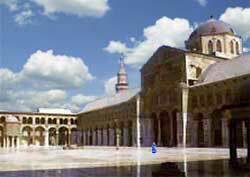 The top tourist draw of Damascus Old City is the Umayyad (also spelled Omayyad) Mosque. It was erected around 700 AD. The Umayyad is renowned for the immense prayer hall. Its floors are blanketed with valuable oriental rugs. Other Umayyad Mosque marvels include the vast courtyard (for scale, notice the blue-robed person in the photo) and the stunning mosaic work on the walls and archways.